I was recently assigned to do a very unusual job for GEO magazine – half assistent half photographer. The job was to photograph schools that are using innovative tools in their teaching. One example being a so called SteveJobs School in Amsterdam. Every student there has an Ipad on which they do their tasks individually. It was completely different to the kind of school i went to. 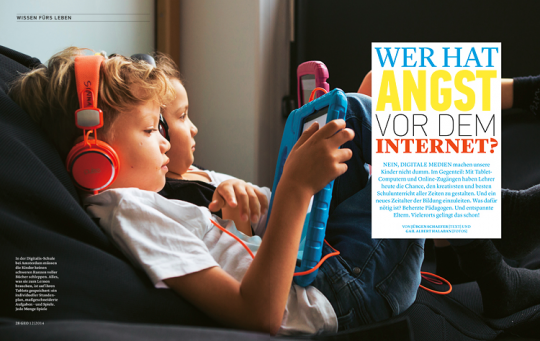 The story can be read in GEO germany’s current issue. The whole operation involved american photographer Gail Albert Halaban, a lot of technology and myself. The idea was for Gail to take photos in Europe without leaving her desk in New York City. This is how it worked: I went to the schools, set up a camera, lighting and two computers. I connected one of the computers to my camera and allowed Gail to take control over this computer with a program called LogMeIn. This way she could release the shutter of the camera in CaptureOne. The other computer was used to communicate via Skype. Once everything was running, Gail was able to talk to me and the students, capture images and look at them instantly, „almost“ as if she was there. The editors asked me to shoot some pictures myself if had the time. I had little but was happy to see that one of my pictures ended up as the opening spread for the story. I wouldn’t say that this is the most effective way to take pictures, but it was nevertheless very interseting to see what is possible using modern technology these days.